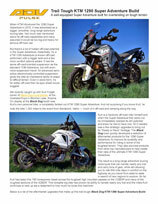 BDCW produces many upgrades for the 1190 Adventure. Please call or write for assistance or if you have any questions. Read this review by ADVPulse for an excellent overview of BDCW upgrades for the KTM 1090/1190/1290 Adventure line.